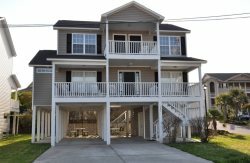 Treat yourself and your family to luxurious vacation living at The Ashworth, an 18-story condominium community directly on the oceanfront in the Ocean Drive Section of North Myrtle Beach. These fabulous condos offer all the amenities you've come to expect in a first class resort, including both indoor and outdoor pools, lazy river, whirlpool spa and kiddie pool. You'll enjoy unparalleled views of the Atlantic Ocean from your private balcony while being close to all the action of Main Street. Relax on the oceanfront sundeck, picnic on the beautifully landscaped lawn areas or stroll to all the nearby shops and restaurants. Don't forget your laptop because The Ashworth offers free high speed wireless internet access too! You'll have no excuse to miss your daily workout routine because The Ashworth also has a fitness facility onsite.